Okay, interwebs world, you all get to vote on something rather pressing. Do I put the Lincoln painting back on view in the stairwell where it usually hangs? It is always on view and accessible to the public. This reduces the amount of handling of the object, which can be a good thing for an artwork. Conservators say that generally the less handling, the better as it reduces some likelihood of damage in frequent transit. It is displayed in a less than ideal area where most visitors can easily miss seeing it and it is difficult to fully appreciate it. You can barely even read the title plate when it is displayed there. It is also very difficult to move it into and from this location as it requires scaffolding and very brave handlers, hence its current once-a-decade movement schedule. It is also constantly subject to environmental factors such as visible light, dust/pollutants, and higher humidity levels in this placement. This is really not ideal for the object’s long-term preservation. Or, do I put the painting into object storage while we install our next exhibit, and wait for brief moments in between exhibits when I can properly feature it? I can display it in a better viewing, lighting, and installation area. It will be kept in low-light and humidity level area, which is better for its long-term preservation. It is less accessible to daily visitors. Display of the painting would be brief and dependent on temporary exhibits schedule. Feel free to add additional comments or questions if you’re so inclined. I’d love to hear from you! Sarah Bulger is a senior at Old Dominion University and will be graduating in the Fall of 2019 with her BA in Art History. Though she came to ODU as a chemistry major, when she took Introduction to the Visual Arts in her second semester, she realized that her passion was the study of art history. She is currently the President of the Student Art History Association and the Treasurer of the German Club at ODU. Sarah aspires to continue her education by earning a Master’s in Art History and Library Science, followed by a Doctorate in Medieval Studies and hopes to one day work as an archivist of medieval manuscripts. The Hermitage Museum and Gardens contains an impressive collection of arts spanning from ancient Chinese tomb goods to contemporary American paintings. While a majority of the pieces in the collection are Asian sculptures, pottery, religious pieces, and glass snuff bottles, there are also paintings from the 20th century and earlier, furniture pieces from the European Baroque era, and a small collection of Roman glass vessels. These glass vessels may catch the eye briefly with their tiny stature and varied colors and patinas, but they beg the question of how they may have been originally used, and how they ended up here among statues of the Buddha, elegant figurines of court ladies from China, and paintings of the Sloane family. This report will discuss the history of Roman glass molding and blowing, those characteristics of Roman glass vessels in the Hermitage Museum which identify origins and uses, and a brief history of the Hammer Galleries where these vessels were purchased by Florence Sloane. The earliest method for producing small glass vessels for cosmetics was core-forming, encountered in the second millennium BC in Western Asia. The Hellenistic age saw a transition away from core-forming to casting glass, and by the first century AD the Roman glass industry made rapid technical advances which brought about glassblowing, the method that would have been used for the majority of the glass vessels, or unguentarium, in the Hermitage collection. This introduction of glassblowing also coincides with the establishment of the Roman Empire, and the availability of glassware made by glassblowing technology grew to include crude formed affordable vessels for common use, and luxuriously decorated glass containers for patricians and elites alike. One common misuse of the term “Roman glass” is in describing glasses made in the provinces of the Roman Empire and not actually in Rome, as blown glass starting in the Christian era is often called simply “Roman glass.” As the technology of glassblowing advanced in the age of the Empire, so too did different styles evolve throughout Europe, the Middle East, and Egypt separate from Rome with influence from their own respective pasts in glass making. In this circumstance it is important to be able to identify individual characteristics in form, shape, size, and color of glass vessels to identify what function they served and attempt to identify which region of the Roman Empire they may have been produced in, though this can be difficult. One example of cosmetic uses of glass vessels available in both research and the Hermitage Museum’s collection is that of a double-chambered glass vessel with a handle looping over the top and connecting either side at the rim. A vessel just like the one described, possibly made in Tell Nimrin, Israel, was found to contain residue of galena. Galena, with its subtle silvery luster, was used as an eye makeup but was made of toxic lead-based mineral powder. The aesthetic of galena as eye makeup must have outweighed the health risks since in the fourth and fifth centuries it was more popular than ever. Small glass unguentaria would have likely been used to contain liquids and possibly even transport those liquids in small distances as they are carried around on the body throughout the day. “It is possible that these vessels were suspended from the individual’s wrist or from a hook by means of a strap or cord tied around the neck of the vessel.” The narrow mouths and closed shapes of many of the unguentaria found, including those in the Hermitage, are appropriate for a container of liquids, such as wine or water, for the time. They could also hold more viscous substances like oil or honey. The term balsamarium has also been used by archaeologists to indicate probable contents. Liquid perfumes would also easily fall into the list of items that unguentaria contained, both in the “giant” vessels for storage and in smaller vessels for application and travel. The Hermitage Museum’s collection of Roman glasses come with their own backstory. Collection archival records show that each glass vessel was purchased by Mrs. Florence Sloane from one Hammer Galleries out of New York City. The dates of purchase for many of them are close, falling in the mid 1940s, with a couple more purchased in the 1950s. The Hammer Galleries still exists today, though their focus is in Impressionist and Modern Masters. There are no records available online or to the public (as can be easily found) to indicate a history in the dealing of antiquities, or even specifically glass. It is possible that the Hammer Galleries still hold a ledger showing Mrs. Sloane’s purchase of ancient glass in the mid 20th century. The Roman glass unguentaria in the Hermitage Museum and Garden’s collection delight the eyes with their ranging iridescent colors and their fascinating forms. Glass blowing is an age-old practice having formed out of earlier traditions of glassmaking. The various shapes and sizes of unguentaria found in the Hermitage’s collection provide a brief glimpse into the cosmetic practices of ancient Rome. The double-chambered vessel may have held the makeup of a wealthy Roman citizen, and the small bodied long-necked vessels may have transported perfumes, oils, or even honey. The unguentaria in this collection at one point may have delighted many senses and they continue to do the same today for patrons of the Hermitage Museum and Gardens. H.E.M. Cool, The Small Finds and Vessel Glass from Insula VI.1 Pompeii: Excavations 1995-2006, Oxford: Archaeopress Publishing Limited, 2016. 58. Virginia R. Anderson-Stojanović, “The Chronology and Function of Ceramic Unguentaria,” American Journal of Archaeology 91 (1):106. Frederic Neuburg, Ancient Glass, Toronto: University of Toronto Press, 1962, 64. Stuart J. Fleming, Roman Glass: Reflections on Cultural Change, Piladelphia: University of Pennsylvania Museum of Archaeology, 1999, 103. Virginia R. Anderson-Stojanović, “The Chronology and Function of Ceramic Unguentaria,” American Journal of Archaeology 91 (1): 114. Exhibit-E.com. “About.” Hammer Galleries. Accessed March 13, 2019. http://www.hammergalleries.com/about. Come one, come all. The Douglas Volk exhibit is up through May 12! Taking some time today for a little Throwback Thursday. On February 7th we held a special “first look” gallery talk and tour of our winter/spring exhibit, Rediscovering Douglas Volk: the life and legacy of an American portraitist, to guests at our February Nightcap event. Fittingly, that evening was also the 84th anniversary of artist Douglas Volk’s death. We had a great turn out and were especially honored to have a special guest with us to debut the exhibit, Dr. Christine Isabelle Oaklander from Allentown, Pennsylvania. Dr. Oaklander is an integral part of the story of how the development for a Douglas Volk exhibit came about. She and I were able to share with guests how the Hermitage acquired seven drawings in 2018 and go through each gallery, highlighting the combination of new and existing, as well as two loaned artworks on view in the exhibit. It all started for me in late 2017, when I was contacted by Dr. Oaklander about a beloved work in our collection: Abraham Lincoln Breasting the Winds (1926). She contacted me about a drawing she had just acquired in 2016 that resembled our painting of Abraham Lincoln by the artist Douglas Volk. As she explained, she had recently purchased a large collection of materials from an art dealer who had purchased these from the 2006 estate sale of the deceased artist’s family estate (Hewnoaks). Once she sent me an image of the drawing she had described, I was intrigued, and personally very interested to see what else she had in her own private collection. So I made a trip to her home in Allentown, Pennsylvania. When I met with her, she was very nice and extremely knowledgeable. Turns out she has been a scholar and art historian of American art for the past 30 years and formerly the curator of the Allentown Art Museum. She has also been involved with a variety of national and local arts organizations, museums and fairs. She allowed me and my co-worker to go through the stacks of material she had on Douglas Volk for the entire afternoon. I was astounded by the breadth of her collection. Knowing that I had to be very focused in what I was looking through (which is very hard when you’re in an amazing treasure trove! ), I pulled out seven drawings that I felt would add significantly to our existing collection of Douglas Volk materials. I did not know if my collections committee or the Hermitage board would be interested in 1, let alone 7 drawings from this collection. But through Dr. Oaklander’s generosity, I was able to make a strong case for acquisition. After a careful decision-making process, the collections committee recommended that this move on to the Board and the Board of Trustees voted to acquire these works last year. I was extremely excited to be able to bring these rare treasures to the collection. The Hermitage does not acquire works very frequently. There is a very strict set of criteria for what makes an object(s) a candidate for the collection. Limitations of exhibit and storage space are also a primary concern when deciding on items to accept into the collection, which is why we simply cannot accept everyone’s lovely antique sofa or grandmother’s Victorian chair (Antique stores are great alternatives for things like this). Part of the decision process involves determining what kind of value or significance an object(s) has. Is it related to something that is already in the collection? Is it in better condition or does it add to our interpretation of that work, or is it redundant? Is it related to the Sloane family? Is it in good, museum-quality condition, or is it in serious need of conservation work? After asking such questions and examining the works, the collections committee approved the acquisition! The next step: get the artworks framed and start planning to unveil them in a special way. I also dove deep into our archives at the Hermitage to pull out materials relating to what we already knew about Douglas Volk. Through a bit more research, I came into contact with several very kind and generous individuals at the Lovell Historical Society and the Illinois History and Lincoln Collections at the University of Illinois, who were extremely helpful in tracking down additional information. The end result is our current exhibition, Rediscovering Douglas Volk: The life and legacy of an American Portraitist. It will be on view through May 12 this year and I hope that as the weather finally warms a bit and the annual parade of spring foliage brings you to the Hermitage, that you take a minute to see the exhibit upstairs. The museum is still here…and we are still doing things…I promise! So, I must apologize for the embarrassingly long hiatus from posting anything nearly all year. The lovely Trudy Gaba, who was an excellent curatorial intern last spring, has since moved to my hometown of Cincinnati where she has been working since April as a curatorial assistant at the Cincinnati Art Museum. If you are in that area, please do check out the beautiful exhibit she helped to put together there: Collecting Calligraphy: Arts of The Islamic World. First and foremost, if I have not yet mentioned this in earlier posts, I need to: We received some VERY exciting news in November of 2017….. we are officially an AAM- accredited institution! What does this mean: it means that all staff, both past and present, have worked their butts off and passed a really big exam. Yay team! This has been a goal for our museum for several years. In 2012, the museum embarked on a Museum Assessment that basically told us how feasible it would be for us to even apply to go through the accreditation process. But the goal of accreditation has been part of our board’s strategic plan for many, many years leading up to this point. Like accreditation of a major university, accreditation for a museum is a tremendous accomplishment. It is a high profile, peer-based validation of your museum’s operations and impact- an indicator of how well you are serving the community and how well you operate. It means that you hold yourself and the organization accountable and that you operate to the highest professional standards as set forth by the American Alliance of Museums (AAM). The accreditation process is a series of policy and procedural review, self-study (written essay questions and answers with supporting documentation and record-keeping), and a pretty invasive and nerve-wracking site visit by two accreditation officers who are usually high-ranking, extremely respected professionals from various national museums. They have a lengthy list of criteria against which they determine how well you meet museum standards. Every department is evaluated and the staff as a whole is evaluated for how well we work together and communicate with each other. Collections Stewardship: that we own, exhibit and use collections that are appropriate to our mission; that we legally, ethically and effectively manage the collection, documents; that we care for the collection; that we conduct collections-related research appropriate to appropriate scholarly standards; that we strategically plan for the use and development of our collections; that we are guided by our mission and provide public access to the collections while ensuring their preservation. Professional Practices: That we plan strategically and act ethically as stewards; That we know what we have, where they came from, why we have them, their current conditions and locations and provide regular, reasonable access to them; That we have a current, board-approved collections management policy that guides the stewardship of our collection; That we have and maintain a system of documentation and record-keeping; That we monitor environmental conditions and use appropriate methods for display; That we have safety and security procedures in place. Anyway, all of this to say that we passed the test and we will be going through re-accreditation again in 5 years (2022) to continually renew our status as an accredited museum. I hope those who follow this blog who may have worked here in years past are pleased with this news! And I hope you know that we couldn’t have done it without your leg work. In other news, we recently acquired some new collection items this year! This is also a HUGE accomplishment for the museum. We do not usually acquire new artworks because 1. we strategically focus our energy and funds on caring for the collection we have and 2. we are so limited on storage and exhibit space that it is usually not feasible to acquire many more. In February of 2018 I was able to secure the acquisition of 7 drawings by American portrait artist Douglas Volk (1856-1935). Volk was a close, personal friend of the Sloane family and we have several of his finished oil paintings in our permanent collection. One of which is a very unique depiction of Abraham Lincoln. In fact during his lifetime, Volk was best known as the “painter of Lincoln” and completed three official portraits of the president which are in collections at the National Gallery, the White House, and the Portland Museum of Art. By the early 1900s, Volk spent most of his time in Maine with his wife and children on a large piece of land in an incredible estate that they lovingly named Hewnoaks. 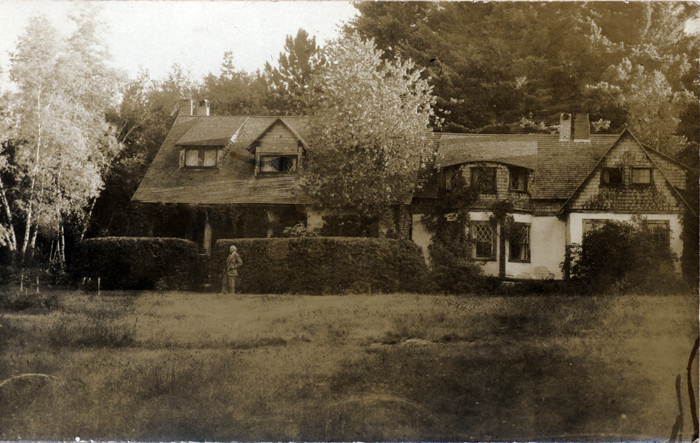 It was a sprawling Arts and Crafts-inspired home situated on Kezar Lake in Center Lovell, Maine that functions today as an artist in residency program. Imagine this with mountain and lake views. Dreamy, right!???? After Volk’s death, the home passed from one family member to the next until the last living relative passed away in 2005. In her will, the relative bequeathed the estate and all of its contents to the University of Maine. Not quite knowing what to do with all of the materials, the University sold most of the items at auction in 2006. Materials included stacks of Douglas Volk’s art portfolios, his wife and daughters hand-woven and dyed Sabatos rugs and many personal family letters, papers and various effects. In 2016, an independent art historian and collector acquired some of the items from the sale. Among the items she acquired were rare drawings and studies done by the artist. By February, 2018, I had the board’s approval to acquire some of these rare drawings and welcome them to the Hermitage Museum. These new drawings, which were purchased in part with funds from the Lela Marshall Hine Trust, will be on view with our additional completed oil paintings by the artist this winter/spring, February-May. I’ll try and remember to snap some photos of us installing the exhibit as a teaser. And I will probably share a bit more about some of the archival things I’ve been digging through in preparation for the display. But I do hope you come and see what we have this winter/spring. Now on to 2019! Let’s hope it’s a good one! Happy holidays, everyone. The Chinese New Year or Spring Festival is China’s biggest and most important holiday. This year, it kicks off on Friday, February 16th and lasts until Sunday Feb. 18th. Today, the current Year of the Rooster will give way to the Year of the Dog. Each new year is marked by the characteristics of one of twelve zodiac animals: the rat, ox, tiger, rabbit, dragon, snake, horse, sheep, monkey, rooster, dog and pig. Those who are fortunate enough to be born in the Year of the Dog are often considered to be loyal, honest, and selfless. This decorative pottery piece from the Ming Dynasty (14th-17th Century), currently on view in the museum, is commonly referred to as a fu-dog. No, your eyes are not playing tricks on you. The fu-dog is not actually a dog at all; it’s an Imperial guardian lion. As popular symbols in Chinese Buddhism, the statues of guardian lions traditionally stood in front of Chinese Imperial palaces, homes, tombs, and temples and were believed to have powerful mythic protective benefits. The fu-dogs are symbolic, protective statues, and they are designed in pairs — one is female, the other is male. The female represents yin, and symbolically protects the people dwelling inside the home, while the male statue, representing yang, protects the structure itself. Tied to the Chinese lunar calendar, the Chinese New Year is traditionally a time to honour household and heavenly deities as well as ancestors. It is also a time to bring family together for feasting. In preparation for the holiday, houses are thoroughly cleansed to rid the home of any ill-fortunes that may be been collected during the old year. Ritual sacrifices of food and paper coins are also offered to the gods and ancestors. Paper scrolls with lucky messages are also pinned to the windows and gates of homes to bring good fortune and you may on occasion hear a few firecrackers going off, for they are used to frighten way evil spirits. Chinese immigrants brought these old-world traditions and rituals—including Chinese New Year celebrations—to the host country. These old-world rituals served as a link between immigrants and their home countries and created a sense of community in their adopted country. Want to see more of our collection of Asian objects? Chinese Neolithic jade and archaic ceremonial bronze vessels from the Western Zhou Dynasty (11th Century – 771 BCE) from the permanent collection are also on view in the galleries!